“It was my dream to play in Europe…I wanted it so bad. It takes a lot of work through. The first two years, I didn’t enjoy myself. 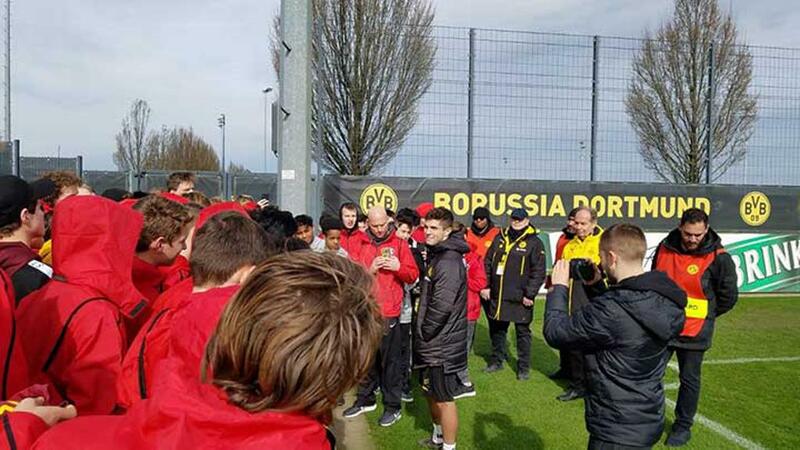 It was tough, a lot of hard times and I thought about going back and giving up plenty of times, but I would say when it gets tough that’s when you’ve got to keep going.” – Christian Pulisic addressing our ODP teams after BVB’s open training session. After breakfast, our boys boarded buses bound for BVB’s open training session. We arrived an hour before Dortmund officially began training. The goalkeepers were out on the field getting their workout prior to the field players coming out. Our players were especially excited to see Christian Pulisic and waited patiently for him and the rest of the Dortmund’s players. Eight players who did not play or were subbed on in the Champions League game the night before came out first for their 75-minute training session. After a jog around the field and warmup routine. the players participated in some passing/receiving activities, a small 3v3 to target game and a 5v5 game to goal. At the end of the session, the players entertained the crowd juggling the ball while moving forward about five yards to the top of the box before trying to score with a half volley. The players were definitely having a good time with this activity. At the midpoint of the session, the players who had played the 90 minutes in the match the day before came out to greet the spectators, sign autographs and take pictures. They were all very approachable and embraced the opportunity to show gratitude to their fan base. While the starting 11 were busy with the fans, the training session with the remaining squad continued on the field. When practice ended, those remaining players including Christian Pulisic, a fan favorite, made their way through the crowd to sign autographs. For weeks, I had been in contact with Mark Pulisic to see if there was any chance that his son, Christian, a U.S. MNT player from Pennsylvania would take a few minutes to talk to our boys. Our guide, Martin, was also in contact with Christian’s agent. His father seemed interested and earnest; our guide seemed somewhat less confident but agreed that it was worth the effort. We had nothing to lose. After practice, Christian made his way over to the boards separating the fans from the field. I wasn’t sure what to expect, but seeing the other players signing and taking selfies with the boys, I felt confident that they would have some interaction with Christian Pulisic, even if it was brief. Truthfully, none of us anticipated what would happen next. By the time Christian made it to the end of the line of fans, the place had cleared out. 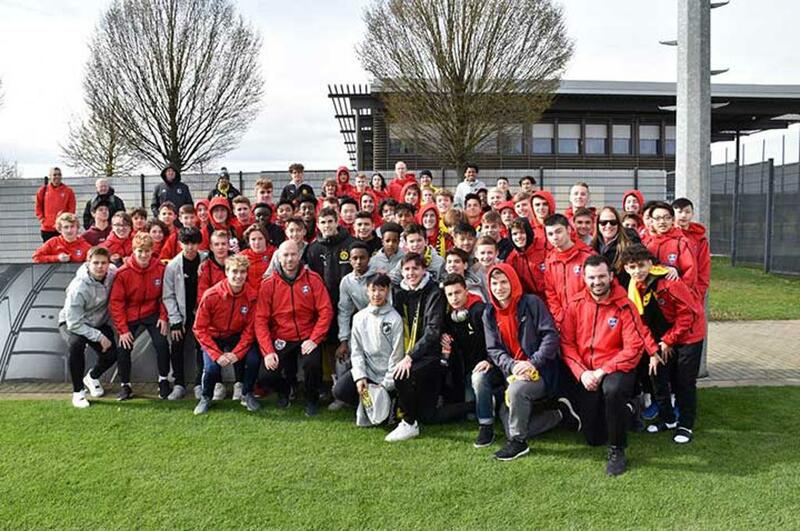 Our boys, who were previously scattered throughout the length of the crowd getting selfies with and autographs from Pulisic, had gathered at the end. Our players, looking sharp, sporting their red jackets were easy to spot and when we gathered as a group, you couldn’t miss us. Christian stopped when he got our group. Christian told me that he had spoken with his dad the night before and was aware that we would be here to watch the training session. He was incredibly generous, spending more than 10 minutes talking with our boys, thanking them for coming and answering their questions. No exaggeration, when Pulisic was speaking you could have heard a pin drop as our boisterous boys were 100% tuned in and hanging on every word. It was a tremendously special experience for everyone present. When we arrived back at Wedau and reconnected to our hotel’s Wi-Fi, I saw that I had received an email from Mark Pulisic. It simply read, “Did he say hello to the boys?” When I responded by telling him how impressed we were with the depth of Christian’s interaction with our players and how our boys will be putting together a thank you to forward to him, he was happy to hear all of it. Christian Pulisic poses for a photo with our teams after the open training session at BVB. Afterwards, our guide Martin informed me that what had happened at BVB was very special. He said players like Pulisic are bombarded with requests and it becomes both impossible and tiresome to try and fulfill them all. He said you could see that Pulisic was genuinely happy to be talking with our boys, answering their questions, more like a mentor to junior player than a professional footballer to a fan. Back at Duisburg, the skies looked questionable again and by the time we took to the fields to train, the rains returned. Our boys trained hard in spite of the weather. They were particularly excited that we replicated the training session we observed earlier at BVB and they performed well. We feel prepared and excited for our games on Thursday evening when all three of our teams will take on German opponents on home turf at Wedau Complex. Following training and dinner, many of the boys gathered in the lobby or each other’s rooms to watch the Man U vs. PSG Champion’s League game. It has been nice to see how well they’ve gelled both as teams and as a larger group. The energy was very upbeat as they recounted their experiences that day with each other and to family and friends back home. Some days just exceed your wildest dreams. There is no doubt that today’s experience is one the boys will remember for a lifetime. Christian Pulisic fielding questions from an enthusiastic and starstruck ODP fan base.